Hidden Content Give reaction or reply to this topic to see the hidden content. 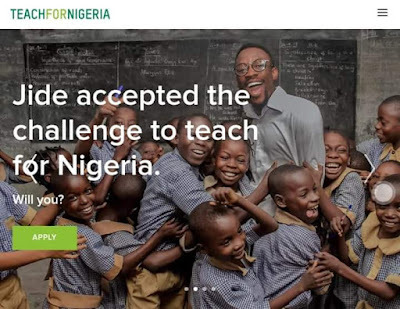 Teach for Nigeria recruit Nigerian graduates from varied disciplines to teach in Nigeria’s underserved schools in low-income communities through a selective, two-year full time paid program. The Teach For Nigeria Fellowship begins with a six-week residential training program before going to the classroom. Here, Fellows are exposed to curriculum, lesson planning, and classroom facilitation and student assessments among other modules, sessions and keys to successful teaching. Teach for Nigeria Fellows receive support throughout the duration of their Fellowship. Teach for Nigeria tutors and coaches will be available to guide Fellows to become effective teachers and leaders. There will be on-going teacher training, mentoring and professional development for personal development. Yes. As a Teach For Nigeria Fellow, you are a part of the movement of young leaders working to eliminate educational inequity. In addition, these are some of the benefits of being a Fellow: Opportunity to be part of a movement that is changing lives and that will change society Extensive leadership development training Intensive teacher training leading to a Postgraduate Diploma in Education Real responsibility from day one Job and internship opportunities during and post-Fellowship Opportunity to be a part of a global network of change agents from across 42 countries Access to a 9 month Mentoring Programme, offering a unique opportunity to achieve professional and personal development. Hidden Content Give reaction or reply to this topic to see the hidden content. Access to professional development and a network of supporters Ongoing leadership development, coaching, business training and skills workshops Opportunity to design and implement a social change project A stipend for two years including during the school holidays. About 9-10 weeks of holiday. FOR MORE INFORMATION: Hidden Content Give reaction or reply to this topic to see the hidden content. A man has been accused of setting his wife on fire in Benin city, Edo state. According to Facebook user Ejiroghene Ezaga, the accused man identified as Mr. Monday Alli Onaivi, allegedly set his wife named Esther Alli, – ablaze following an alleged disagreement of money for upkeep. The incident reportedly happened few weeks ago in the capital city. It was gathered that 33-year-old woman later passed away in the hospital after being rushed for treatment due to burn injuries she sustained. The corpse of the mother of three children has since been deposited in a mortuary as report has it that the husband is currently on the run. Mr. Abeulah was stabbed by his girlfriend Miss Alice. Mr. Abeulah is a native of Delta state, who lives in Bolo Town of ogu/bolo LGA with his girlfriend Miss Alice Peter who is a native of Ogoni. According to eye witness Mr. Abeulah was said to be making a call when his girlfriend miss Alice Peter barged in and stabbed him on the eye. Speaking further the eye witness said the reason why she stabbed the victim is because he was calling another woman . The victim was rushed to a nearby pharmacy for urgent medical treatment. As of the time of this report the matter has been taken by Bolo youth council. Godswill Akpabio, senator representing Akwa Ibom north-west, says some clergymen in Akwa Ibom state have been casting aspersions on him since he defected to the All Progressives Congress (APC). In August, 2018, Akpabio who was minority leader at the senate, resigned his position and renounced his membership of the Peoples Democratic Party (PDP). Responding to how his critics have taken his decision to join APC, Akpabio said his defection overshadowed every discussion in Akwa Ibom state and cast a spell of fear over the PDP who started paying clergymen to lie against him. “I am happy that God is not like some of His priests,” he wrote in an article. “Ever since I decamped to APC, they have been praying against me and they have joined in peddling the lies about me. Very well known Church prelates and Bishops that dined with me for 8 years while I was governor, despite my benevolence to them and their families joined the fray calling me killer herdsman for joining APC. “But some of these men of God were in this same Country in 2012 when the farmers/herdsmen clashes claimed the lives of over 1000 people in the Benue/Plateau/Mambilla axis. At that time, a Christian was the President but was not accused of being a killer of Christians. The farmers/herdsmen clashes predate Nigeria’s Independence. “The clashes have occurred under various leadership. Yet the “men of God” have been unconscionable in accusing the current President of masterminding genocide against Christians because he is a Muslim. I am happy that God does not condemn a man based on one man’s testimony, but He sees the heart and judges our motives and intentions. Whether one is a Christian or Muslim, we all worship the same God WHO will at the appointed time judge us from our deeds in words and actions.” Akpabio said in the course of this election, he had been photo-shopped by propaganda merchants who told the lies about him. He said his letterhead and signature had been forged by the same merchants to write falsehood as if he wrote them. He alleged that they conscripted women from South Africa who claimed to be foreign observers and paid them to lie that he detained them using thugs. Akpabio also said he met Udom Emmanuel , governor of the state, performing the duties of a deacon in Qua Iboe Church, Surulere , Lagos, and he immediately adjudged that as a deacon, he would superintend over the affairs of the state with the fear of God. “Whether I was right or wrong is for history to judge. Nevertheless I picked him to succeed me and by the grace of God and the votes of Akwa Ibom electorates, he won the election. So God made him governor,” he said. The senator, who lost his reelection bid, is currently at the tribunal. Hidden Content Give reaction or reply to this topic to see the hidden content. Vice-President Yemi Osinbajo says a team of 63 fingerprint experts, including 50 from the UK police, worked to help the then Action Congress of Nigeria (ACN) reclaim some states that were allegedly rigged by the Peoples Democratic Party (PDP) in 2007. He listed the states as Osun, Ekiti, Ondo and Edo. Only Ondo that was not under the control of ACN then but Bola Tinubu, then the leader of ACN, had used his influence in assisting Olusegun Mimiko, a former governor of Ondo, to take the state from the PDP. Mimiko belonged to the Labour party at the time. He later defected to the PDP. Speaking at the 11th colloquium of Bola Tinubu, a national leader of the All Progressives Congress (APC), the vice-president said Tinubu told him that they needed to prove that there was case of over voting. “In 2007, when our party, then ACN, was rigged out of elections in Osun, Ekiti, Ondo and in Edo state. He invited me to his residence at bourdillion and he said the only way we can possibly reclaim the states that was taken away from us is going through the courts. He said the only is by proving that there was multiple voting. Meaning that a few people singlehandedly thumb-printed ballot papers, dumped them into ballot boxes and they were counted in favour of the opposition, the PDP,” he said. “He said the only we can do this – he said ‘I don’t know how you will do this’ – but some how proving that their is evidence that this is what happened. “I said ‘Asiwaju, nobody has ever proven that in an electoral case’ and I said what is even more is that there are over a million ballot papers, how can we prove it? He said that was his view and I should look for a way of sorting this out. “So I went to to the UK and met with possibly the most experienced [expert] in the entire UK. When I told the enormity of the problem, he laughed and almost fell off his chair. He said in all his experience as a finger print expert he has not done up to 4000 prints and you are now saying I should come and do 1.3 million finger prints. That was a Thursday and he called me back on Monday and he said let’s talk again about this. And we did, and somehow we found a away. “We used a bit of technology. Most importantly we were able to get finger print experts. In the end, we hired 63 finger print experts, 50 of them were from the UK police. Asiwaju had to persuade the authorities to release them all together 63 police men – they were working for almost six months. “We were able to put together a strong forensic case that showed that that the places that were defeated it was on account of multiple voting. To cut the long long story short, one by one, we were able to get the states taken from us.” Hidden Content Give reaction or reply to this topic to see the hidden content. This is an example block Guest, for 9jaonline.com.